I put this simple layout together with a couple of Basic Grey papers and one from the newer Studio Calico line, Wanderlust. The pages are from a book I picked up at a used book store, and while it felt wrong to cut it apart, I do like the layers. When I went to make my title, I wanted to use the cork letters from a past Studio Calico kit, but didn't have the right ones available. I ended up cutting out the negative shape for the R and the A and was good to go. My typical additions of stitching, sequins, washi tape, and a shaped clip rounded out the embellishing. For any other book lovers, the book pictured is S. by JJ Abrams and Doug Dorst and has so far been an interesting read. Not only is the story full of mystery, it is full of notes and artifacts tucked between the pages that serve as further details to connect you to all of the players. Definitely not something that can be achieved with an e-reader. Hope you have a lovely weekend! Great page and what a cool interactive book! Awesome page! The layering looks great! 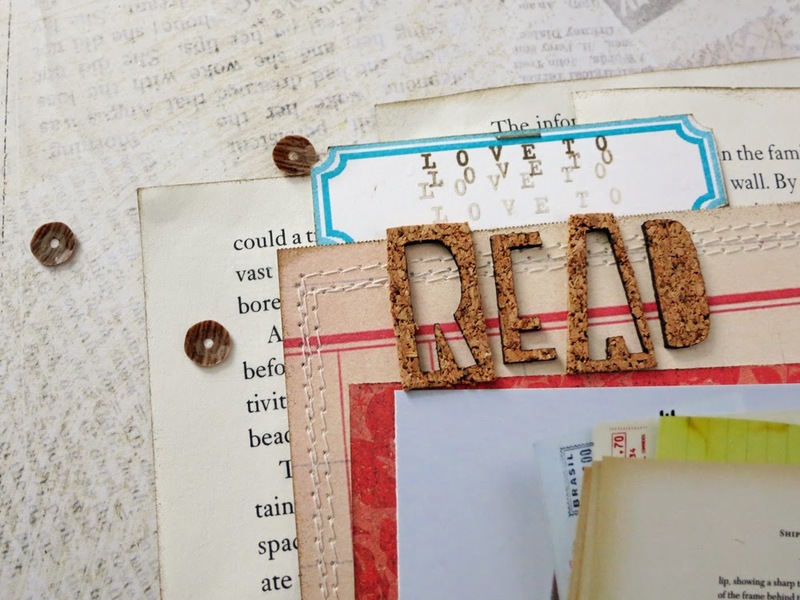 Perfect choices in paper and layering for a book page. I prefer a real book myself. Haven't read that one but John Updike did a book titled S. many years ago. It was in diary form. Elise, I love the layering of pages and your cork title. Like you I am a partial to the physical aspects of reading a book. Plus I love being able to give someone a book once I've read it. I love how you used the book paper. Sooo neat. The cork letters are fabulous too. Wonderful and creative background ! I never did that. I really should use old pages to make something (embellishments, maybe ?) because I love the look ! Great layout. Love this page! I love reading too although I don't make enough time for it. I use a Kindle but I do miss holding an actual book sometimes! I've mercer cut up a book before... It would feel very strange!! I am an avid reader who loves books, but hasn't read in a bit. My friend was trying to convince me to donate my books and get an e-reader…NEVER. There is just something about having a real book in your hands. Love everything about this page. My Kindle is a necessity due to being on the go so much, but I will never EVER give up my love for an actual book! This is beautiful, I really like how you used the negative on the letters. I read all the time, I love books but I was bought a Kindle as a present and I actually read more now because I can afford to buy more books. Love everything about this, Elise! 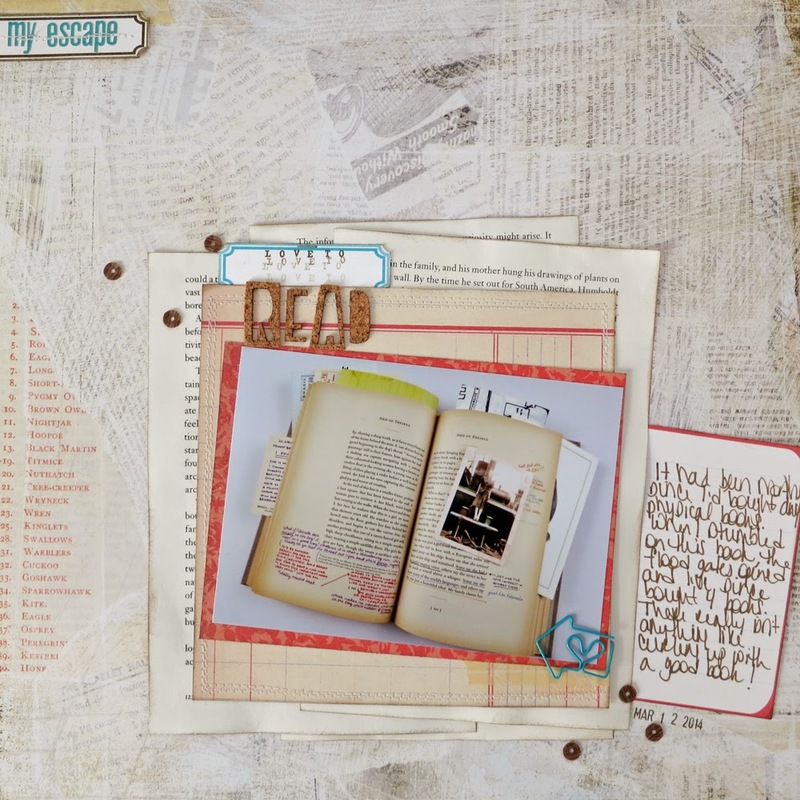 The layering is fabulous, especially with the book pages added in. I like reading "real" books too, although I get most of them from the library. I just praised this over at 2p's! This is a fabulous page! !